If you are anything like me, this post will get your "nosey" senses tingling like crazy. I can't help it...I love to know the tiny ins and outs about people (I like to know everything I possibly can about those in my community!) So when they dare to show what's in their purses, I giggle with delight. It's like I'm seeing something I shouldn't! But I am! Because they are allowing me! Hooray! I realized my purse is boring. So I apologize for that. But incase you were ever wondering- wish granted. Wallet | Hobo : I have had this thing for YEARS! So although it is a bit upfront, it is totally worth it because it lasts forever! Make Up Pouch | Thrifted : I love this thing, my husband and I found it on Oahu while on our honeymoon. I carry it with me every day and it is full of tweezers, chapstick, nail files, and bandaids. 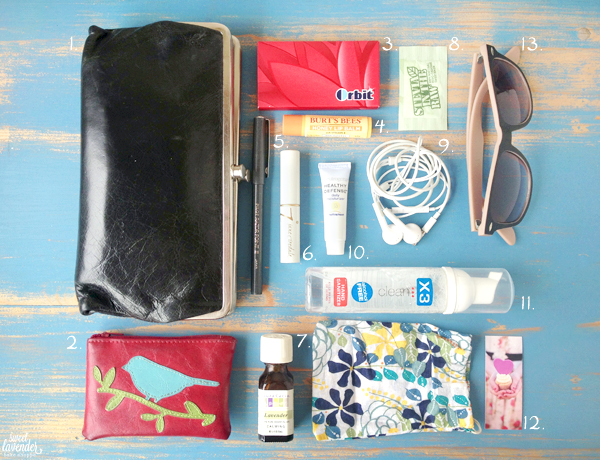 Strawberry Gum | Orbit : Gum is ALWAYS in my purse. That, or Gingermints from Trader Joe's. I read somewhere that gum is bad for you...so I'm trying to switch over to purely Gingermints. We'll see. Honey Beeswax Chapstick | Burt's Bees : The best. Always. I can't use anything with peppermint or spearmint in it, so I always use Burt's Bees in Honey. I love the smell and feel of it on. Pen for Notes | Pilot Razor Point II : My friend Jodi introduced me to these dang pens. They are like writing on butter. Lipgloss | Jane Iredale : A natural lip..stick? Stain? Gloss? Yep! It goes on clear and gently changes a light hue of blush. Lavender Essential Oil | Aura Cacia : Always, always, ALWAYS have lavender essential oil on me (sometimes literally)! It makes the yummiest all natural perfume! Sweetener | Stevia in the Raw : Carrying a few packets of this makes heading to a coffee shop or out to lunch that much simpler for me. I'm not forced to use alternative (icky) sweeteners nor do I have to use the refined kind. Headphones | Apple : You know...for awkward long lines or talking to peeps on my phone, while in the car. Sunscreen | Neutrogena : You never know when you will be stuck outside for a long period of time, and need to add that extra bit of protection. This is Southern California. Hand Sanitizer | X3 Clean : Love this stuff. No alcohol, removes 99% of germs, and makes my hands feel like I washed them with soap and water. I can't go anywhere without the stuff. Business Cards + Pouch | Moo.com : You never know who you will run into, and it pays to be prepared! Sometimes literally! Sunglasses | Urban Outfitters : $12 for these babies. 'Nuff Said. How cute is that makeup bag?! And yes, I totally have that curiosity, too. My bag contains lots of, um, trash... wrappers... crumbs..(???) I don't even have children so I'm always baffled as to how my bag looks like it's been in the hands of a two year old for a week. Oh my goodness this made me laugh! Thank you for the morning giggle! How did I not know you guys when to Hawaii for your honeymoon? So did we!!! It was so amazing! I love all the stuff in your purse... I should do one of mine again soon. But it's mostly target receipts and diaper wipes. I love that you carry sweetener around..that's such a great idea! It's been such a lifesaver! I love these posts! 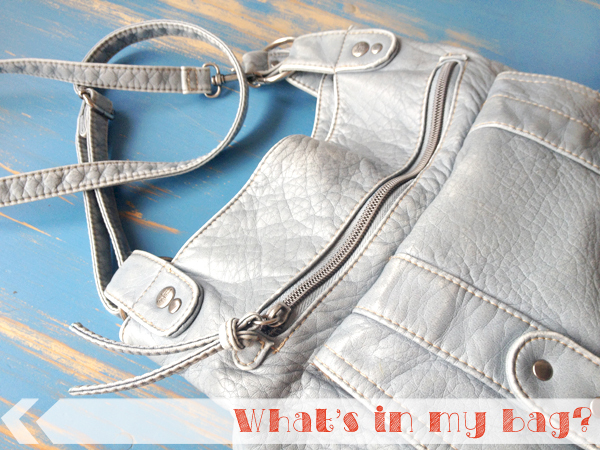 I love to ask my friends if I can snoop through their purses mainly because I want to know what I should have in mine! Mine always ends up with all kinds of junk though! Hahaha! Yeah, I totally know that feeling! I saw your Coral dilemma! Oh man, what a nightmare indeed! Have you found any suitable ending to it? Love these kinds of posts...because I'm extremely nosey :) And how adorable are your business cards?!?! You're making me really want to order some custom toppers for our gender reveal party coming up! I have some of the same things in my bag! I would be so scared to show everything in my bag- it's like a suitcase!